Fernehalwes taking a break from putting the final touches on the Beta Version localization to bring you a sneak peek at an atypical Saturday here at Square-Enix headquarters. 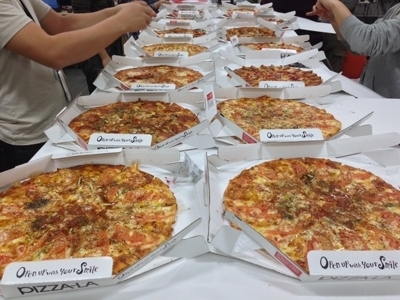 And, to thank us for coming in on our day off, Yoshi-P dusted the cobwebs off the old wallet, and sprung for...wait for it...pizza! Which, knowing how much Japanese pizza costs, probably ran him about a half-month’s salary (okay, okay, that was another slight exaggeration…it was probably closer to three-weeks’ salary). 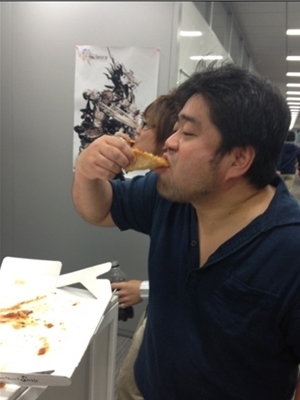 Oh, and here’s a shot of the lovable Komoto-san finishing off his sixth pie. All that devving can really work up an appetite! Talk to you all again soon...from the other side of the world! 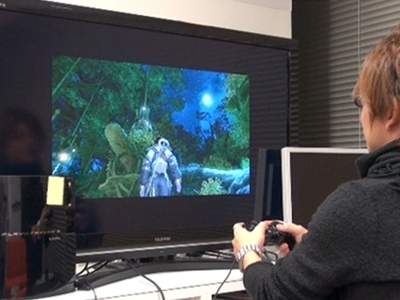 Like Final Fantasy XI, the game specs will be extremely high for the time, but in about 5 years, an average machine can run it on max settings with little to no issues. Tanaka also expressed interest in making a benchmark program available. Pizza and PS3. Best blog post ever. On a more elaborate note, as someone who was expecting to be playing this game on PS3 when it launched "simultaneously" with PC, only to have my expectations crushed when it got "delayed," only to have them pulverized when it got put on "indefinite hold" after the PC version bombed, it's pretty exciting to see a picture of the PS3 version being played after five years of waiting. Yeah, so after reading this I really got curious about "japanese" pizza. I had never really thought about it being all that different from whats in america, but wow... I did a little bit of research and learned that a large sized pizza in japan is around the same size as an american small. Also, delivery costs an arm and a leg along with the outragous price tag for the pizza alone. $20-$30 per large... So what does japanese mayo taste like? It's not the fatty/greasy taste like american mayo? It's not so different from ours, really. Oil, egg, and an emulsifier, though they have a lot of mayo-based sauces that have other flavors to them. Mayonaisse is just more common as a "base" for food sauces, like tomato paste is used here in things like steak sauces and hot sauces. They use mayo for pizzas here in the U.S., too. Go to a California Pizza Kitchen, and there are a lot of pizzas with mayo-based sauces. I have never seen that before and am ashamed of it. The Pterodactyl won me over. Hadn't seen the mayo one; hilarious. Love the brain one, too.